He replaces co-founding member Oli Herbert, who passed away in October. Jason Richardson has officially been named the new lead guitarist for All That Remains. Richardson, who previously played with Born of Osiris, All Shall Perish and Chelsea Grin, has been with the band since November, when he was brought in to replace original lead guitarist and co-founding member Oli Herbert, who was found dead at the age of 44 on October 16, 2018. 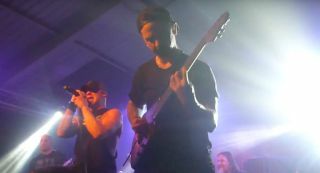 The band announced in an official statement: “All That Remains would like to clarify that guitarist Jason Richardson is now an official member of the band. Some recent interviews were conducted before a decision was made or announced regarding Jason. But the band has indeed welcomed him into the fold as an official member and is excited to get back on the tour and play for fans." All That Remains’ ninth studio album, Victims of the New Disease, was released on November 9 via Razor & Tie.